To experience the disappearance of a loved one is a particularly painful and traumatic experience. The purpose of this guide is twofold. 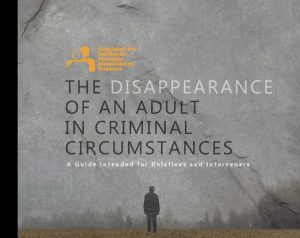 It aims to support the relatives of adults who have disappeared in criminal circumstances, to better inform them of the steps to be taken and to raise public awareness of this issue. Indeed, the reality of these people and the issues they face are too often ignored. This guide was produced by the Association des familles de personnes assassinées ou disparues (AFPAD). The content engages only the latter. All rights reserved to AFPAD. Reproduction in whole or in part of the contents of this guide is forbidden, except with prior permission received from AFPAD. A paper copy may be sent by mail: please send us your complete address by email at administration@afpad.ca or by contact 1 877 484-0404. During her internship, Justine Razafindramboa, master’s student in Social Work at the University of Montreal, wrote and designed this guide following an assessment of member’s needs with the AFPAD team. This guide was made possible through the collaboration of families of missing persons and professionals from the police, legal and aid communities who have agreed to share their experience and testimony. We would like to thank them. This project would not have been possible without their involvement and generosity. Graphic design, translation and printing were made possible with the funding of the Justice Canada Ministry through the 2017 Victims and Survivors of Crime Week 2017.